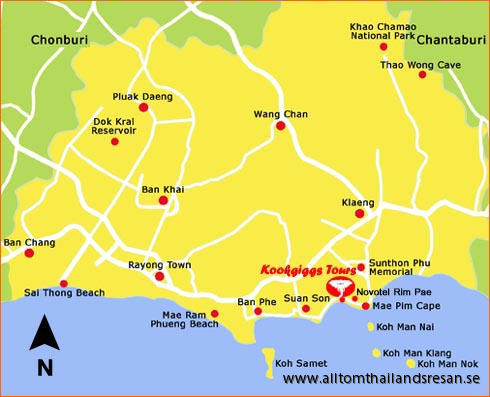 Allt om Thailandsresan cooperates with KOOKGIGG TOUR for excursions in the area around Rayong, Mae Phim, Ban Phe Koh Samet and Mae Ramphung. You'll find excursions that suits all tastes and approaches, both on land and at sea. Why not tour at sea or another excursion ashore. All tours take place with air-conditioned buses. Boat excursions occur with speed boats and guided tours is in English. You order your excursion at home already especially during the high season, there are many who go on excursions and tours of various types and it can be good to be in time to book an excursion in Thailand. Our excursions is suitable for both adults and children. * Pick up at hotel / your accommodation at agreed time. Then the journey goes off to the sea where a speedboat is waiting. The journey to Koh Man Nai takes about 20 to 30 minutes. Arrival to Koh Man Nai. First we visit the turtle farm on the island, then we go over to the other side of the island and visit the baby turtles. * Departure from Koh Man Nai to Koh Thalu, journey takes about 20-30 minutes. Arrival to Koh Thalu. A possibility to snorkeling and see the coral reef and all the beautiful fish. For those who want to relax you can sunbathe and swim here. * Then it will be another snorkeling trip shortly outside the island. Sun and swimming for those who wish. * Departure from Koh Thalu. We run a small tour around the island, then straight back to the mainland. * Price per person and then you have to be at least 4 people. NOTE Insurance does not cover if you lose a life jacket or snorkeling equipment. * It is good to have easy, comfortable shoes that are easy to take on and off. * The timetable can be changed depending on the weather. * More than 10 people, then seafood will also be served at lunch. * Pick up at hotel / your accommodation at agreed time. The journey to the sea where a speedboat waiting. The journey to Koh Kudi takes about 30 minutes. Arrival to Koh Kudi. Here are the possibility to snorkeling and discover the beautiful world that exists beneath the surface. You can find blue sponge clam, giant clam, sea cucumber etc. ..
And for those who wish, there is obviously a possibility to relax with sun and swimming. * Departure from Koh Kudi Koh Thalu, journey take about 20 minutes. Arrival to Koh Thalu. Here are the possibility to snorkeling and see the coral reef and all the beautiful fish. For those who want to relax you can sunbathe and swim here. * Lunch, which is served on the beach. Lovely fresh fruit and traditional Thai food served. * Then it will be another snorkeling trip outside the island. And the sun and swimming for those who wish. * Departure from Koh Thalu. We tour around the island, then make it straight back to the mainland. * Pick up at hotel / your accommodation at agreed time. Journey to the sea where a speedboat waiting. The trip to Koh Samet takes about 20 minutes. Arrival to Koh Samet. Here are the possibility to relaxation, sunbathing, on the inviting white sandy beach. Treat yourself with massages, hair and nail treatment. Also plenty of lovely food and drink. Even a little shopping can be done. * Departure from Koh Samet to Koh Kudi trip over take about 20 minutes. Arrival to Koh Kudi. Here are the possibility to snorkeling and see the coral reef and all the beautiful fish. For those who want to relax you can sunbathe and swim here. And also take a walk around the island. * Departure from Koh Kudi. The journey back to the mainland. NOTE Insurance does not cover if you lose a life jacket or snorkeling equipment. * It is good to have easy, comfortable shoes that are easy to take on and off. * More than 10 people, will also offer seafood at lunch. * Pick up at hotel / your accommodation at agreed time. We journey to the sea where a speedboat is waiting. The trip to Koh Samet takes about 20 minutes. * Departure from Koh Samet to Koh Thalu trip over to take about 30 minutes. Arrival to Koh Thalu. Here are the possibility to snorkeling and see the coral reef and all the beautiful fish, shortly outside the island. For those who want to relax you can sunbathe and swim here. * Departure from Koh Thalu. We go back to the mainland. * More than 10 people, then we will also serve seafood at lunch.